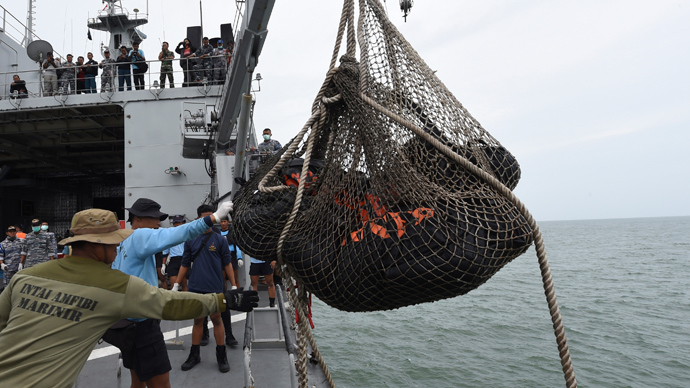 Search teams have discovered four large parts of AirAsia QZ8501, and 30 bodies of victims have been recovered, Indonesian search officials said. The plane crashed Sunday into the Java Sea with 162 people onboard. Earlier in the day, Indonesian search and rescue said that they had discovered two parts of the plane. "With the discovery of an oil spill and two big parts of the aircraft, I can assure you these are the parts of the AirAsia plane we have been looking for," search and rescue chief Bambang Soelistyo told journalists. The larger of the objects is 10 meters by five meters, and both are at a depth of about 30 meters, he said. “We are lowering an ROV (remotely operated underwater vehicle) underwater to get an actual picture of the objects detected on the sea floor,” Soelistyo said. However, a strong current is now hampering recovery efforts, he added. Over the past few days, rough weather had made search operations difficult, but 30 bodies of victims have been recovered. The bodies of 12 people were leaving Pangkalan Bun for Surabaya: eight were flown in on Saturday, four on Friday. Nine of the bodies are male, three female. A total of 60 vessels and 20 aircraft are taking part in the operation, with the search currently narrowed down to 1,575 square nautical miles, AFP reported. Meanwhile, the missing jet might have had no permission to fly from Surabaya to Singapore on Sunday morning, and its flights on this route had been officially suspended for that day of the week since October. "We will also investigate the party that gave permission to AirAsia to fly on that day," Djoko Muratmodjo, acting general director for Indonesia’s air navigation in the transport ministry said on Saturday. Officials are going to investigate all AirAsia flight schedules. “We won't focus on licenses, just schedules,” Muratmodjo said adding it was possible the company’s license in Indonesia might be revoked. Before October, the airline was allowed to operate along that route daily, but in October, the ministry issued a permit for AirAsia to fly the route only on Mondays, Tuesdays, Thursdays and Saturdays, for the winter of late 2014 to early 2015, transportation ministry spokesman J.A. Barata said.